Musical Written by and Starring Country Music Legend Larry Gatlin to be Featured April 28 – May 7, 2017 at the Irving Art Center Carpenter Performance Hall in Dallas, Texas. 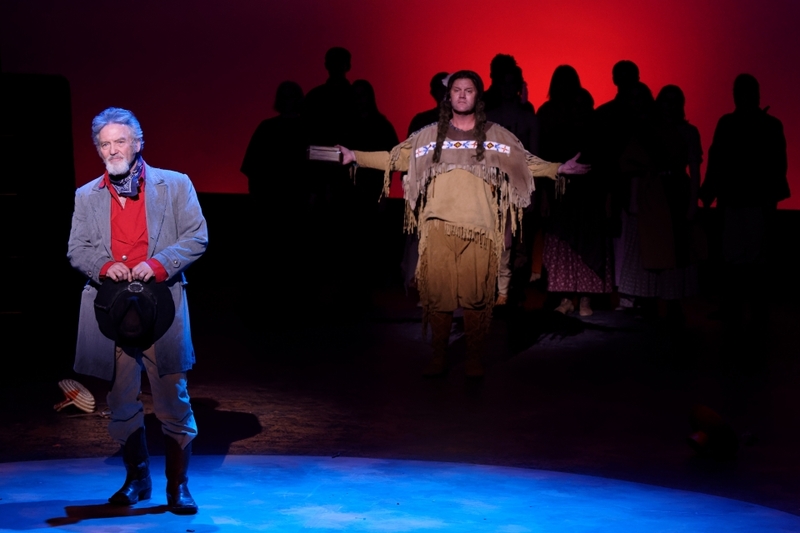 Nashville, Tenn. (March 1, 2017) — Quanah, the Parker Family Saga, is a new musical written by Grammy Award-winning country music legend Larry Gatlin. It is the story of Quanah Parker, the last Comanche chief, his mother Cynthia Ann Parker and the Parker Family settling in Texas and the survival and ascendancy of the great Comanche people. It is, in part, a tragic, sad, heartbreaking story – a story of war, bloodshed, death and heartbreak – but it is, more importantly, a story celebrating the strength and power of the human spirit. Gatlin’s wife Janis – who says he is never wrong – believes that it is the best music he has ever written. Multiple Dove and Grammy Award-winning artist, David Phelps is Quanah. Gatlin will play Old Ranger. The supporting cast includes Brett Warner as Lucinda, Lauren Scott as Cynthia Ann, Daron Cockerell as Nauda, Sony Franks as McKenzie and Tim Brawner as James Parker. Quanah composer Galen Butler conducts the Lyric Stage Orchestra with direction and choreography by John De Los Santos. The close family harmonies of Larry Gatlin & the Gatlin Brothers have given the trio a signature sound that led to country classics like “All The Gold In California” and “Houston (Means I’m One Day Closer To You).” Larry, and brothers Rudy and Steve, won a GRAMMY® for their 1976 breakthrough hit, “Broken Lady,” and reached #1 with several other songs soon thereafter. Along with five career nominations for the ACM Vocal Group, the Gatlin Brothers picked up three 1979 trophies – Single of the Year (“All The Gold In California”), Album of the Year (Straight Ahead) and Male Vocalist of the Year for Larry Gatlin. Larry Gatlin has written songs that were later recorded by Elvis Presley, Glen Campbell, Barbra Streisand, Johnny Cash, Kris Kristofferson, Charlie Rich, Dottie West and more. Born In Dallas, raised in Tomball, Texas and now living in Tennessee, David Phelps graduated Baylor University with a music degree in vocal performance. David entered the Billboard charts at No 1 with his Classic DVD in 2012 and his Freedom DVD in 2015. Multiple Dove and Grammy Award winner Phelps has performed at the world’s leading venues from the Sidney Opera House to the White House. For more information on Phelps please visit his website at www.davidphelps.com. Dedicated to the development and preservation of the American musical, Lyric Stage is Dallas County’s only locally produced, professional musical theater company. Under the leadership of Founding Producer Steven Jones and Associate Producer Shane Peterman, it has become North Texas’ most honored theater, winning 35 Dallas Theatre League Leon Rabin Awards and a special citation from the Dallas Theater Critics Forum for excellence and innovation. Lyric Stage has produced 20 world premiere musicals and two Off-Broadway productions.